not so very long ago, bicycles could be purchased with attachments; bits and pieces that, if not quite essential, were certainly of assistance when pedalling here and there, hither and thither. 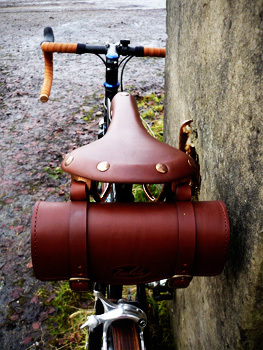 exciting accoutrements such as puncture repair kits, pumps, mini tool kits, mudguards and even, on occasion, a saddlebag. granted, a number of those are hardly the stuff of which cycling legends were made. despite remembering an article in a now sadly lost copy of well phil describing how malcolm elliot (in his first incarnation) swore by the use of a saddlebag for time-trialling, try as i might, i have not come across any photos of fausto, jacques or eddy, featuring pump, guards or that elusive saddlebag. how did they ever manage? coincidentally, many of the photos viewed regarding the above, did sport rather fine, if often tatty leather saddles, something we'll come to in the fullness of time. kids, such as i was at the time of such recollections, have need of carrying stuff about the neighbourhood; any attempt to emulate a milk delivery vehicle is doomed to failure if there is no saddlebag in which to place small stones (chuckies as they were affectionately known) used as the physical metaphor representing milk bottles. oh the joy experienced by many a householder awakening to a pile of chuckies on the doorstep. and should it be seen as necessary to spend mum and dad's money on sweeties, or perhaps being sent on small errands (likely to get us out of the way), sweets and errands had to be placed somewhere. age and maturity bring copies of cycling weekly, cycle sport, procycling and ultimately, rouleur. bicycles were no longer utility vehicles with the sole objective that of transportation; getting to and from real places, one of which was endowed with a purpose. now we were fast, lithe, fit, exciting. except, some of us weren't. indeed, some of us aren't. while a modicum of speed would never go amiss, accompanied by the skinny wheels, bendy bars aesthetic, varying degrees of utility have, yet again, become a pre-requisite. at least they have for me. the chris king cielo is a stylish bicycle; apple's influence did not stop short at the card box in which it arrived. add a pair of full wood fenders and a frame-fit pump, and not only has utlility made strides to re-invigorate itself, but it hasn't done the aesthetic any harm either. i can think of few who would wish to have a bicycle in the bikeshed that bore comparison with graffiti on two wheels. though everyone's taste is not necessarily compatible, i am of the artistic mind that componentry and accessories ought to be chosen with some sort of overall colour plan in mind. referring here to that selfsame cielo, brown fenders and a leather saddle matched with a sparkly black paint job, is subtle yet elegant, one which it seems onerous to continue. 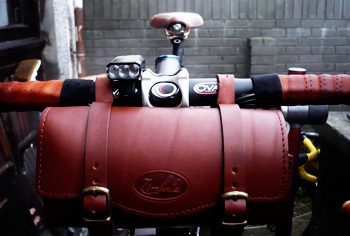 hailing from korea with a distinctly non-korean sounding name, zimbale are largely producers of remarkably fine and often substantial bicycle luggage. not, you will note, in a two wheels and a long handle manner of speaking, but in the way that you would wish to transport ever increasing amounts of stuff on the bicycle. these are not ulitmately destined for the nether regions of a pinarello dogma, a colnago m10 or a trek madone, but for something of more utlilitarian ideal, perhaps currently personified by that of the fixed wheel commuter or perhaps the audax custom. it used to be a feature of the age old cycling magazine that each article be accompanied with photographs containing at least one bicycle, preferably attired with something in cotton duck. for that was the way touring was conducted in such times; panniers were the spawn of the devil. in perhaps similar manner to that of mrs washingmachinepost having to match shoes with handbag, the saddlebag is part of an almost inseparable pair with that of zimbale's leather saddle. this is of impressive length, though suffering mildly from being unsupported at its midpoint and liable to a bit of sag (aren't we all?). the leather, in finest fashion, eventually molds itself to the posterior, often a harsh honeymoon period, but mitigated by the leather's minimal mid-point support, in the zimbale's case, this has been more than pleasurable. the lengthy rails are copper coated, matching the sizeable rivets holding the leather to its frame, but seemingly by way of assistance, the underside sports a stiffly woven carcass. the leather is not alone. 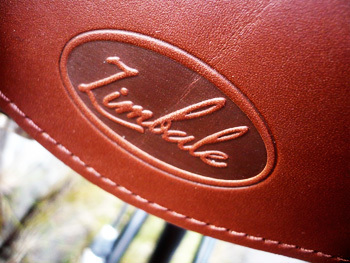 to match not only with the leather zimbale saddlebag under review, but the others in the range, the rear of the saddle sports two slotted hoops through which a pair of leather straps can be firmly affixed. such finely crafted leatherwork would be doubtless be the envy of the pelotonese following in my wake, but i see no reason why they should have all the visual benefit. so after a week or two, i switched the bag to the bars, where it comfortably straps in place, allowing easy access to any comestibles contained within. it also looks even funkier up front. i filled mine with the necessities: a crank brothers multi-tool, milk duds tyre lever, and an appropriately sized inner tube. it could have handled a good deal more. while it could likely be easily remedied, the rattling over less than pristine roads is never less than distracting. neither of these items from zimbale could be considered a case of style over substance; it would seem more favourable to think of both epithets to be complementary. both saddle and its attendant bag are made to a remarkably high standard; there is little, if anything, that has been sacrificed in the process of providing us with the very best for the very best of reasons. zimbale products are new to the uk market, brought to our attention by alexander kim, and at prices that make them even more favourable in the eyes of the cognoscenti. 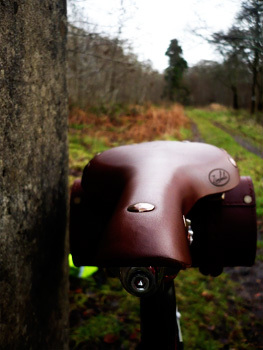 the saddle will retail at around £105 while the increasingly indispensible saddlebag is likely to cost just under half at £50. as inferred above, the range is considerably greater than the two items mentioned here, though at present, the saddle is the sole offering in this department. further details and images can be seen on the zimbale website. 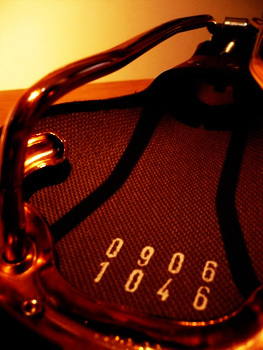 (almost) silent and practical sophistication.